"Book Guides Daily Meditative Practices"
Rabbi Min Kantrowitz has written a clear, concise and spiritual guide to Counting the Omer. It is a valuable source for beginners who want to start as well as the experienced who want to go deeper in their annual practice of Counting the Omer. Easy to understand and a pleasure to read. A must for everyone’s library. Rabbi Min Kantrowitz has written a lovely, lively, and enduring guide for the annual practice of counting the Omer. I have been blessed to have been among the group of meditators who have used it and worked with it for several years. It sustains its interest with repetition and encourages me to go deeper with each year. I highly recommend it for both beginners who are exploring the practice of counting the Omer, as well as for those who, like me, count this counting among our blessings. Rabbi Min Kantrowitz has laid out a guidebook for the 49-day spiritual practice of Counting the Omer that begins on the second night of Passover. 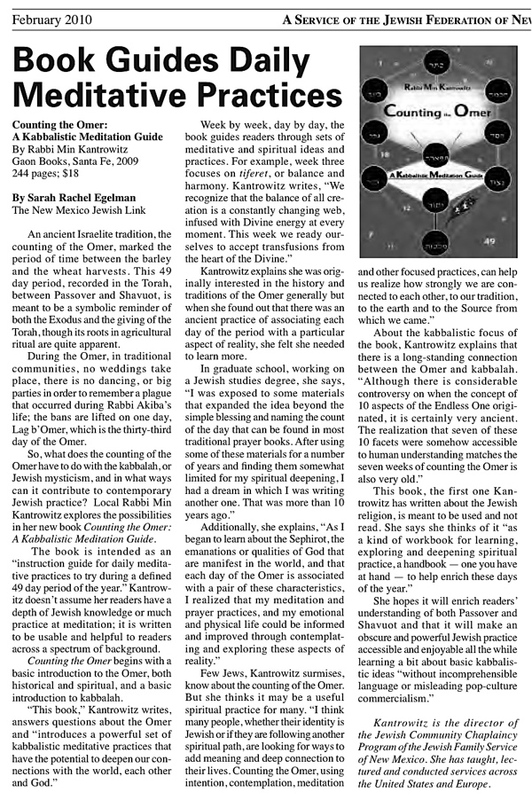 Although the reader may initially be drawn in by the clarity and simplicity of Rabbi Kantrowitz’s words, there is a profound depth of intention to this practice and to Rabbi Kantrowitz’s understanding and ability to guide us well in this journey of spiritual liberation. This book can be used year after year, and, with each reading, new insights towards self-renewal will develop and blossom. Rabbi Kantrowitz has blessed us with a valuable tool for enriching our lives.